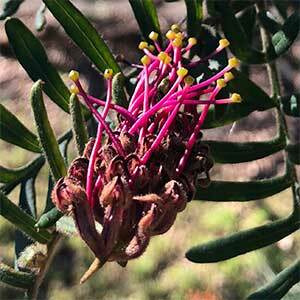 A rare and threatened species Grevillea caleyi is originally from some small pockets in Sydneys northern suburbs. With development and land clearing, what was an uncommon species is now endangered. It is an attractive plant, deep red flowers on a medium sized shrub with a natural spreading habit. It is fortunate that a few specialist nurseries have this plant in cultivation and that efforts are being made to reestablish it in its natural area. In a sunny position and a well drained soil this is an easy care plant. It will grow in a little shade, however flowering is best in full sun. Best grown in an open position where it gets good air flow. Dig the soil over well to twice the diameter of the container. Add some well rotted cow manure and aged compost. Plant at the same level the tree was in the container. Water lightly in the first summer. Mulch around the tree to maintain a cool root run. No fertiliser is required in good soils. You can use a little specialist native plant fertiliser (low phosphate) in poor soils if desired. Height – To around 4 metres plus. Spread – To around 3 metres plus. Flowering time – Winter to Spring. Foliage – Green, ferny in appearance, new growth is tinged with pink.